I love the way with the right combination of colours and textures and a little flick of the wrist you can achieve some results that jump off the page as looking more real than flat paint on paper. That is the theme with this introduction to mixed media techniques, using paints and everyday adhesives to create authentic looking bricks and stones. This workshop is all about trying out a lot of different products in different ways. Please do not feel that you have to go out and purchase exactly all of the same products to get value out of the workshop, there will be a good variety of ways we will achieve the effect of the look of stones and bricks. I love it when people get creative with what they have and find their own styles of working the techniques. For the samples I will show how the brick and stone textures can be used on PostCards. With a size of 4by6inches, the samples can be used as creative inspiration for greeting cards or a title block in your Project Life style scrapbook pages, on a mini canvas, or off the page projects. The techniques are spread across to slide shows with a voice over and 7 cards. 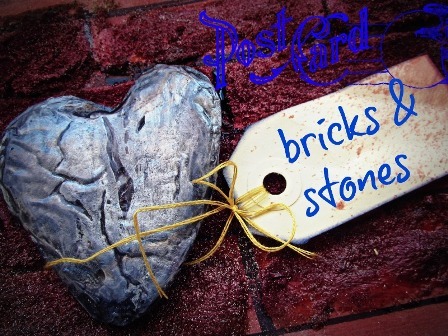 Be the first to review “Postcards Bricks and Stones” Click here to cancel reply.